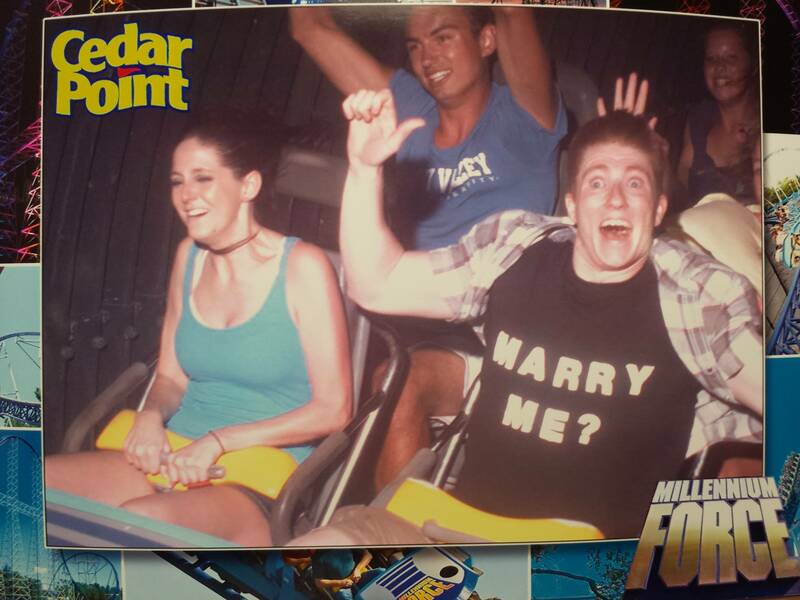 One woman got a really big thrill Sunday after riding the Millennium Force roller coaster at Ohio's Cedar Point amusement park. In the comments, Nightzel explained how he timed the proposal so perfectly. "I had the 'marry me?' shirt on underneath a button-up shirt. I modified the shirt with neodymium magnets so I could open and close it super fast. I also had the ring hidden in my pocket. I opened the shirt for the photo and then closed it as soon as we got out of the tunnel. We walked down to the photo booth and I walked behind her. When she saw our picture she turned around and I got down on one knee. Barely made it through my proposal -- she said 'yes' and lots of tears were shed from both of us." This isn't the only time Cedar Point has been in the news lately; on Friday, seven people were injured on one of the park's water rides when their log flume boat flipped over. Click through the slideshow below for our picks for the 10 best marriage proposals of all time.